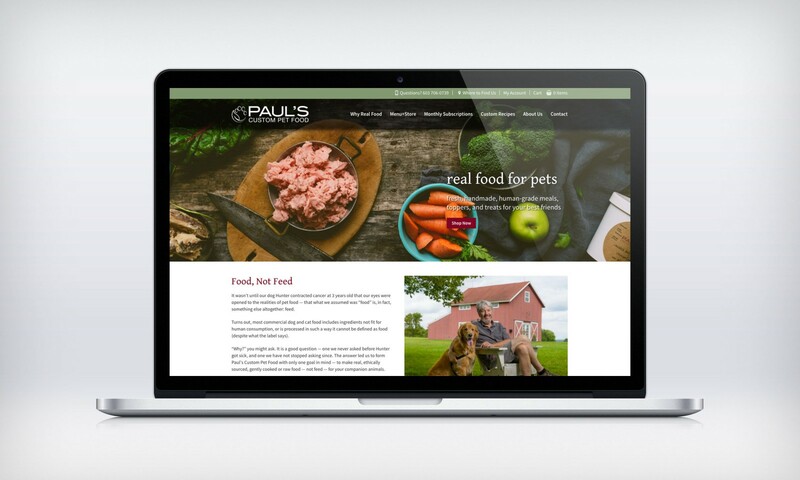 Determined to help others have healthier pets, Paul Gallant opened Paul’s Custom Pet Food located in New Milford, CT. Paul and his wife, Lynn work with pet owners, veterinarians, and pet nutritionists to prepare food for companion animals. They source only the highest-quality organic and/or locally sourced ingredients from farmers and small businesses and makes all food by hand. When it was time for a new website, Paul and Lynn reached out to ecm design who designed their logo. This new website is very user-friendly and includes an e-commerce component where customers can purchase individual packages of “real” pet food or sign up for a 3 or 6 month subscription plan. ecm was given the task to create a way to ship frozen food, and treats with a number of different shipping options. ecm was able to complete the task while staying on budget. ecm located in Exeter was able to meet PCPF’s complex website needs despite the geographical barrier using email and phone conferencing. If your business is looking to improve customer experience and market reach contact us at 603.778.7147.